Alternately enduring and enjoying a sudden increase in temperature and humidity. I’ve taken to the back yard and clearing long forgotten corners of the house. Between bouts of mental gymnastics regarding a favored time, place and genre and late evening straightening. Delving into the 1970s. And its profusion of dramas, thrillers, Noirs, Neo Noirs and some science fiction films that were pleasing to the eye while not insulting the intelligence. To a neat, compact little marvel that deals with the ecology. And its saving decades before it became vogue. Weighing in at just under ninety minutes and featuring the cleverness, subtle humor and skill of master model and special effects, Douglas Trumbull. Backed up by a deftly written script by Michael Cimino and Steven Bochco. And lateraled to a small cast of then, proving themselves talented. 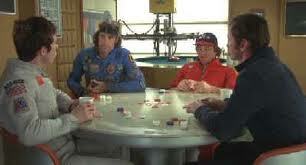 Bruce Dern, Cliff Potts, Ron Rifkin and Jesse Vint. The premise and plot is a popular one for the films of the 70s and beyond. Yet, few films have envisioned it so well. The Earth’s resources have been used up. And the government in busy trying to turn back the clock. Or find new planets to populate or terraform. Leaving Freeman Lowell (Bruce Dern), A fairly gifted electronics technician. John Keenan (Cliff Potts), Marty Baker (Ron Rifkin) and Andy Wolf (Jesse Vint) to find new ways to fight boredom between time inside the ship’s six domes tending to Mother Nature. It is during this time that Lowell finds his inner deeply hidden Tree Hugger. And enjoys being Master of his Domain. Usually working alone. Trimming branches. Damming streams. Taking a moment to have an Eagle light on his outstretched arm. All wonderful to watch as Keenan, Baker and Wolf have go-cart races deep in the bowels of the ship. Biding time. Almost patiently awaiting the word from Earth. To relocate to a new datum and co-ordinates and await a pioneer re-population fleet. Or hang a U-turn and return, post-haste. Lowell doesn’t mind being the eldest and outcast. His character wouldn’t work if he were a joiner. Perhaps oblivious or not to the disdain and comments sent his way. Content to do his thing until the message arrives from Earth. Though it isn’t the message Lowell fervently desires. The Valley Forge and its sister ships are to jettison and destroy with enclosed nuclear warheads their forestry dome and return home for commercial service. The crew is more than ready to pull up stakes. Except for Lowell, who feels betrayal. 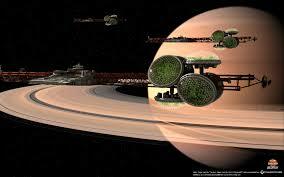 And goes about his quickly laid out scheme to save at least a few of the ship’s domes and move to far side of Saturn. Fellow crewman begin to drop. Jesse Vint’s Andy Wolf is the first. Through accidentally interrupting Lowell’s delaying tactics. Followed more sneakily and stealthily by Keenan and Baker. who happen to be inside domes slated for ejection and destruction. Leaving Lowell with two domes unscathed. And the ship’s three small robots, quickly named Huey, Dewey and Louie for company. Setting a course and plunging through Saturn’s rings in ways more spectacular and memorable than first envisioned by Mr. Kubrick in his, 2001: A Space Odyssey. The ship rumbles, rattles and roars through collective dormant meteors and assorted orbiting planetary debris. Taking damage minor and large. Lowell sends out the robots to make repairs in the solar winds. The ship’s large dish antenna takes damage and Louie is swept away while trying to realign it. Finally, on the far side of Saturn’s rings and quite by themselves. Lowell returns to the domes and accidentally from a scaffold and breaks a leg. Which gives Lowell the time to program the remaining two robots to reset the leg under local anesthetic. And more time to program them to play poker as Lowell recovers. Life improves slowly. Until Lowell begins to see his domed Edens dying due to lack of sunlight. And a message is bounced off sister transport, Beaufort. Letting Lowell that his ship will be boarded within hours. Giving him times to set up large numbers of arc and other lights in the healthier dome. And orders for Dewey to take care of the forest. I’ll leave it right here to not violate Spoilers. And possibly avoid a tear jerking ending and Joan Baez closing tune. Huge kudos to visual magician Douglas Trumbull for having the initiative, vision and wherewithal to assemble a better than decent cadre of writers, cinematographers, special and visual effects talent to take an Alvin Toffler, “Future Shock” concept. And allow his underlings the opportunity to collectively exceed their grasps. High marks also for deciding to make the central set of the story the wide and dimly lit hangar deck of a mothballed Korean War era aircraft carrier. Then allow the set director, Frank Lombardo and assigned dressers to close off areas and save time and money in plying their craft. Then hand it over to the absolute master of distraught personalities, Bruce Dern to embody someone who is slightly less driven than his character in Black Sunday while possessing about a third of the paranoia displayed in Coming Home. Basically, a man with a dream. And the ability to make it happen. For a while. Model work is second to none. Ideas courtesy of Mr. Trumbull. And good enough to be “borrowed’ for several brief “space convoy” scenes in ABC’s Battlestar Galactica. While design of the three robot drones goes to past master, Donald Trumbull. Cinematography by Charles F. Wheeler highlight the cramped, originally white and sterile surroundings infected by a sloppy, lived in look seen in John Carpenter’s Dark Star. Offset by long and padded corridors. Expansive, shadowy go-cart playgrounds and the opulence of the trees and scenery inside the ship’s domes. Charles T. Knight and his Sound and Re-mix Department come into their own through the rings of Saturn. Supporting a Special and Visual Effects crew including a young John Dykstra and technicians too numerous to mention. Creating an oddly, sadly forgotten gem that is much more than the sum of its parts. Agree? Disagree?… The Floor Is Open For Comments. 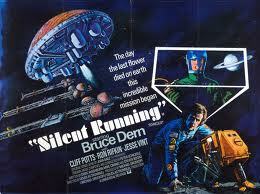 ‘Silent Running’ has been due some attention for awhile. And it’s been a lot of fun and my pleasure to bring this gem and probable future classic to light. I’d seen ‘Silent Running’ a few times before Trumbull’s name and reputation clicked. Which raised it high in my estimation. More so with Cimino and Bochco adding their talent to screenplay and script. Very much a “You’ve Got To Start Somewhere” kind of film that delivers on all levels. I’m petty sure your intrigue will turn into enjoyment on this one! Thanks for an astute write-up of this great film, which I think is being slowly re-discovered. Stanley Kubrick hired a 23 year-old DouglasTrumbull to do special effects for “2001” and really launched his career. But Trumbull became disillusioned with the business side of moviemaking and eventually drifted away from it until doing the great FX for T. Malick’s “Tree of Life” the old fashioned way without computer generation. A great piece of background! I’ve read that Mr. Kubrick could be a hard task master. And studio pressure is rarely a good thing. Though talent, however rare or unique always seeks release. On one’s own or as part of a team or department. It’s admirable that Mr. Trumbull continues to do things his way. And on his own terms. Poor Bruce Dern and his robots. Great film. Great post. Bruce Dern rarely survived his films of the 1970s and 80s. That was part of his character(s). And the actor’s ability to let the audience empathize with him and changing situations. 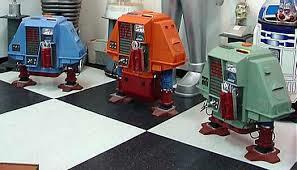 Also think that Huey, Dewey and Louis were far better, more sympathetic characters than R2-D2. Hi Kevin! Oooh I always like a good sci-fi and I need to see more Bruce Dern films so yeah, I need to check this one out! I have you to thank for putting together this homage to superior, non budget breaking sci-fi films. Through your desire to learn more about the small robots, Huey, Dewey and Louie. Everything that makes smart science fiction a strong and viable genre is here. From story. To model work and wonderment. To believable and sympathetic characters. With no one specific being overwhelmed or forgotten by another. Great work! Such an under-rated classic that resonates on so many levels. This is one of the very best reviews of this film I have ever read. Very insightful and a good read. Thanks! It’s always a treat to see your comments! ‘Silent Running’ is right up there with ‘2001’ and later, ‘Star Wars’ for overall story, portrayal, wonderment and flawless execution. With a plot and back story that needed light cast its way. That also helps to enhance the film’s more than serviceable cast. 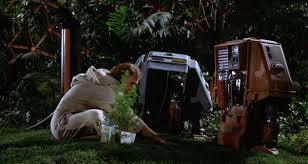 Silent Running was a great movie. I liked the complexity of Lowell’s character, the way he was determined to protect the forests but he was still human. He had feelings, and while he did what he had to he didn’t always like it (we do see that murdering his crew mates does affect his mental state). That, and the visual effects were all amazing. Congratulations on providing the first submission to my Journey Across the Cosmos Blogathon! Thanks, John. Kevin’s post really put a wonderful spotlight on this sci-fi gem. And it’ll be great to have this join in on your wonderful idea for a blogathon.